Smoked salmon does not have the same nutrient value as fresh or frozen salmon [...] Smoking salmon has been found to substantially reduce its omega-3 content. For example, three ounces of baked Chinook salmon contain about two grams of omega-3 fatty acids. This same three-ounce portion of Chinook salmon, when smoked, contains less than one-half gram of omega-3s. This reduction in total omega-3 fatty acids is even greater when we look at one particularly important omega-3-EPA, or eicosapentaenoic acid. Smoked salmon contains about 20% as much EPA as non-smoked salmon on an ounce-for-ounce basis. I can't seem to find much information on this. Can anyone verify these claims? That's a consideration I meant to mention: Is smoked salmon "substantially less nutritious" compared to fried salmon or salmon cooked by other methods? Or just raw? I would happily choose smoked over fried/baked/whatever if I could get conclusive proof that it is healthier (or vice versa!). The brand of smoked salmon I bought was wild. @Pecan From that information it's impossible to say if it's 'good' or 'bad'. An easy thing to check is if they use aroma to enhance the flavour or only the smoke. I wouldn't buy something that has been added aroma. The cold smoke would probably retain more of the oil than the hot smoke I do. You might ask them about the oil content of their fish, because the published numbers are probably for hot smoke. I buy whole salmon when they're fresh and fillet them. Some gets frozen in water, some gets smoked and some gets eaten fresh, but in times of superabundance I have to get a year's worth. Paleos were no different, and would have been smoking everything. Fats like omega 3 would only have been a major part of the diet in season, eating fresh fish. Thank you for the article. This is the brand I picked up: http://www.nolanseafoods.com/our-salmon.html They say: "We smoke the salmon to 23 to 26oC in our controlled Torrey kilns for up to 10 hours, ensuring that every batch of fish gets the same treatment. The smoking process takes place within a fusion of beech and oak chippings creating that rich smoky flavor of top quality Smoked Salmon" Sounds good? Yeah, tracking the nutrients of cooked fish gets quite confusing. Personally omega-3 content is more important than protein for my current purposes. Thanks for replying. On the other hand, Sisson had this post on smoked salmon not that long ago. I haven't studied this subject in great detail. I would suspect this is highly dependent on the salmon, handling, curing, smoking etc. There are a lot of variables to take into account. I can't imagine smoked salmon is worse than cooked salmon much if at all. As previous posters stated you can't compare raw salmon against smoked. The should have raw, baked, pan fried, grilled, broiled, and smoked to really make a point here. I would think some of the other cooking methods would tend to draw a lot more juice and oils out of the fish than smoking. I'd love to eat raw salmon every day but sushi in my area seems to get pricier by the day while the quality and size has been going down steady. The problem with your article is that it only compares smoked to raw salmon and not fried to smoked salmon. Do we eat tons of raw meat because it has a somewhat higher percentage of some fats? No we don't, because we find the maillard reaction to enhance it's flavors. The same holds true for fish of most kinds imho. So, if you like the taste of it, stick to smoked salmon and eat fresh salmon whenever you feel like it. You should be cautious however, as most smoked salmon is also farmed. Take a close look at the labeling. 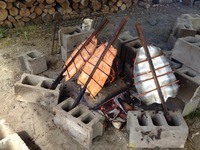 When I smoke salmon it loses a lot of weight, and the loss of oil is noticeable. I looked up chinook smoked vs unsmoked to compare. An 85 gram portion cooked fresh with dry heat is 196 calories and contains 4.9g monounsaturated fat. 85 grams of smoked chinook is 99 calories and contains 1.7g of monounsaturated fat. Considering that the smoked fish is also drier, the loss of the mono fat going from fresh to smoked could very well be 80%. I don't consider the loss of omega oil in smoking to be of much importance. The protein is still there. The fish is preserved for future eating, because the easily oxidized mono fat and high moisture would otherwise cause it to spoil. And finally it tastes good smoked. I like fresh salmon too, but I eat it because it's food, not because it's a dietary supplement. I just started regularly curing my salmon to make lox. Would a two day cure with salt, sugar and lemon somehow reduce the amount of omega 3's? I can't imagine how and have been assuming the lox's nutritional content would be close to raw salmon's. Does anyone know?